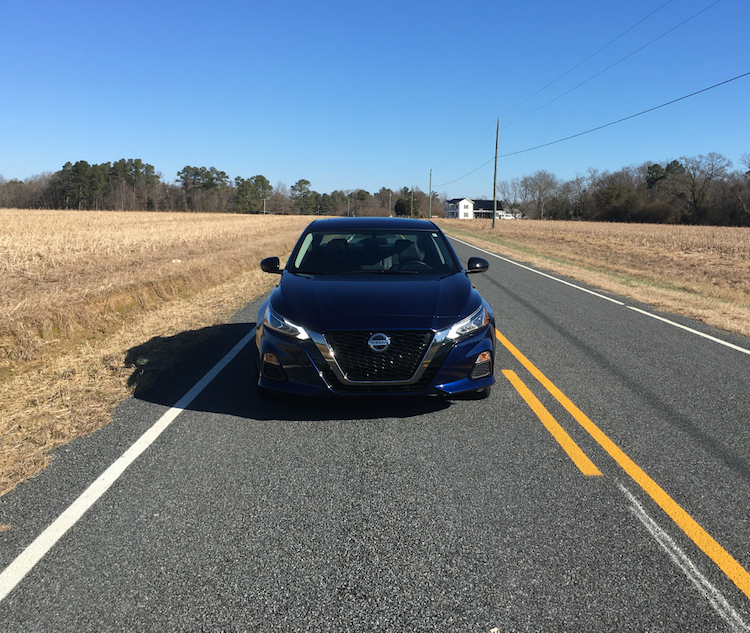 The Sedan is Dead:Long Live the 2019 Nissan Altima! 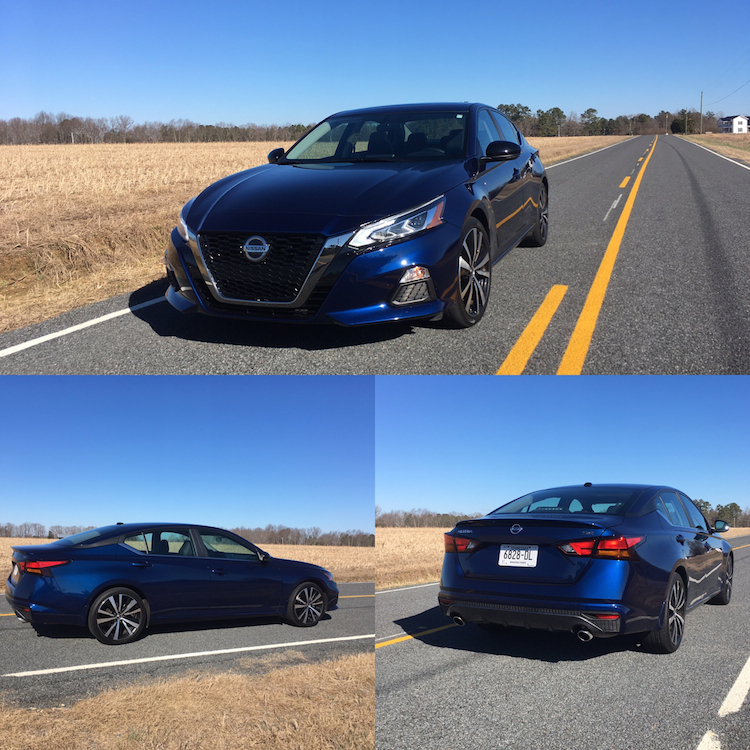 You are here: Home / New Car Reviews / The Sedan is Dead:Long Live the 2019 Nissan Altima! The reason manufacturers are moving away from the coupes and sedans that once defined each company is apparent: SUVs and trucks are a hot commodity. They’re also much more profitable than conventional cars. And the data supports that consumers want them. Not every manufacturer is following this reasoning — at least not completely — as they believe there is something of value by remaining in a shrinking segment. Indeed, companies such as Honda (Accord), Toyota (Camry) and now Nissan are doubling down by offering new versions of their still popular midsize sedans. For Nissan, that means its Altima model not only sees its sixth generation, but brings several important changes of note. What changes mark the 2019 Altima? There are many, in fact, there may be too many to cover in a standard review. That’s why we’ll spend some extra time mentioning the key points and then drilling down on each one. 1. Its dimensions are slightly larger. Over the years, we’ve seen the Altima grow. Early on it was a compact model, then it made the transition to a midsize car. The coupe is no longer available, leaving the sedan as the lone body style of choice. For 2019, the Altima gains some size, with nearly an extra two inches between the wheels (109.3 v. 111.2 inches). Overall, its length is just one inch longer as Nissan trimmed its overhangs. Its width is nearly an inch wider and the Altima’s height is incrementally taller. Overall, you have a sedan that has improved legroom and a trunk size that’s unchanged (15.4 cubic feet). It is worth noting that the all-new Altima is larger than the 2019 Maxima, the brand’s flagship sedan. We’re not sure what Nissan’s long-term strategy is with the Maxima, but if you’re looking for potent V6 power, the Maxima has it. 2. Two engine choices, but with a difference. Nissan has long offered a 2.5-liter four-cylinder engine as standard equipment and that hasn’t changed. What has changed is the engine itself — it is a new design with a lower profile, improvements in noise, vibration and harshness, and updates to various parts, including to the intake port, control valve, and the oil pump. As a result of these changes, the 2019 Altima offers more power than the previous model (188 hp; 180 lb.-ft. of torque v. 177 hp; 179 lb.-ft. of torque) and a slight boost in fuel efficiency. Notably, the new Altima is rated as high as 28 mpg in the city and 39 mpg on the highway. The more significant change for 2019 has everything to do with the optional engine. Gone is the previous 3.5-liter V6, as it has been replaced by a turbocharged 2.0-liter four-cylinder engine. What’s significant about this new engine is that it is the first variable compression design of its kind, ranging from 8:1 (for high performance) and 14:1 (for high efficiency). By mastering the typically fixed compression ratio, the automaker squeezes out more power when needed or makes this engine more efficient. This engine makes 248 horsepower and 280 pound-feet of torque compared to the 270 horsepower and 251 pound-feet of torque of the V6 [we tested it in the 2019 Infiniti QX50]. In effect, Nissan delivers a wash for an engine that has a smaller footprint. Importantly, the new engine is more efficient too — as equipped the Altima makes 25 mpg in the city and 34 mpg on the highway. That’s up from 22/32 mpg city/highway with the V6. As before, both engines work with a continuously variable transmission, which is a gearless automatic transmission often referenced as a CVT. All-wheel drive is a bit of an anomaly in the mainstream midsize sedan segment. Subaru offers standard all-wheel drive with its Legacy and has done so for years. Ford has all-wheel drive on the Fusion Sport, but we know the Fusion’s days are numbered. Previously, the Chrysler 200 had an all-wheel-drive option, but that sedan was discontinued following the 2017 model year. The 2019 Altima comes with standard front-wheel drive and available all-wheel drive. The latter is available only with the standard 2.5-liter engine and not with the turbo. A Nissan executive told me that the decision to go with all-wheel drive was due in part to demand for all-wheel-drive versions of the popular Rogue crossover. Customers want the option, especially in snowy areas. Obviously, the Altima gives shoppers an option that few competitors offer. Apart from engine technology — and that’s not a small thing — Nissan continues to refine and update its other technologies. Most trims come with ProPILOT Assist, which Nissan says serves as the foundation for autonomous vehicles of the future. We’ve tried the system in several Nissan models, but it wasn’t offered in our test SR trim. Nevertheless, this system is ideal for single-lane driving, particularly when you’re driving long distances and can use a little relief in the acceleration, steering, and braking categories. It is designed to lessen driver fatigue and imbue confidence when behind the wheel. We couldn’t help but notice that the new Altima has some of the design cues of the Maxima, Nissan’s flagship sedan. Apparent on first sight is the floating roof design, a Maxima feature. It is nicely executed on the Altima, giving this sedan a premium look. Up front, the grille stands out like never before. That’s due in part to the plunging hood, including the creases that meet the grille’s edge. It is also the latest expression of Nissan’s V-motion grille, which places a bigger accent on the headlamps. Other standout features include a rising beltline, a pronounced rear deck with large wraparound tail lamps, and diffuser-like trim with dual exhaust ports. The list of standard exterior features includes 16-inch steel wheels. Among the upgrades are LED lights, fog lights, aluminum alloy wheels, heated side mirrors, and a rear spoiler. Inside, the cabin is spacious with excellent sightlines, a layered dashboard with twin stitching and a clean instrument panel. The overall look seems a cut above for the segment, although most manufacturers are similarly well adorned. I particularly like the “bolt-on” design of the center display as it is easy to read, but it doesn’t clutter the look. Lots of soft-touch materials dress the cabin with a touch of elegance. My SR model featured contrast stitching running down the center of the seats. The amount of legroom up front will please even the tallest passengers. Nissan says it measures 45 inches, which is at the top of the spectrum amongst all vehicles. 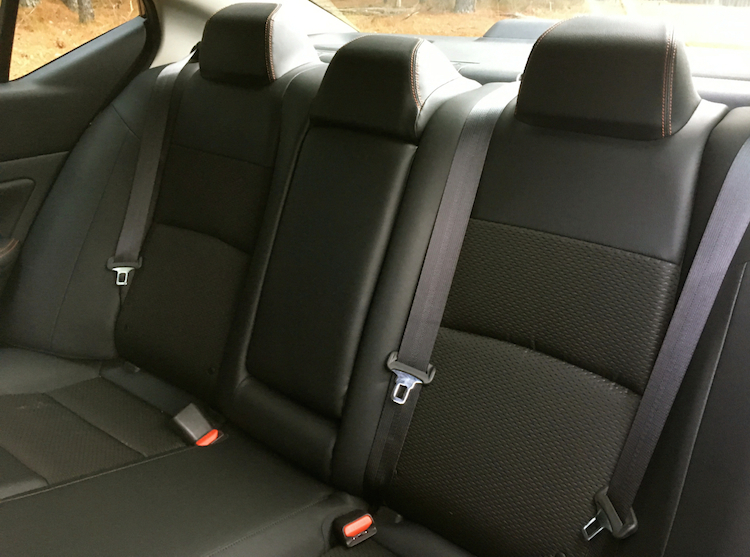 The rear seat doesn’t have as much legroom, but three can still sit in comfort. In all, the new Altima seems larger than what it is. 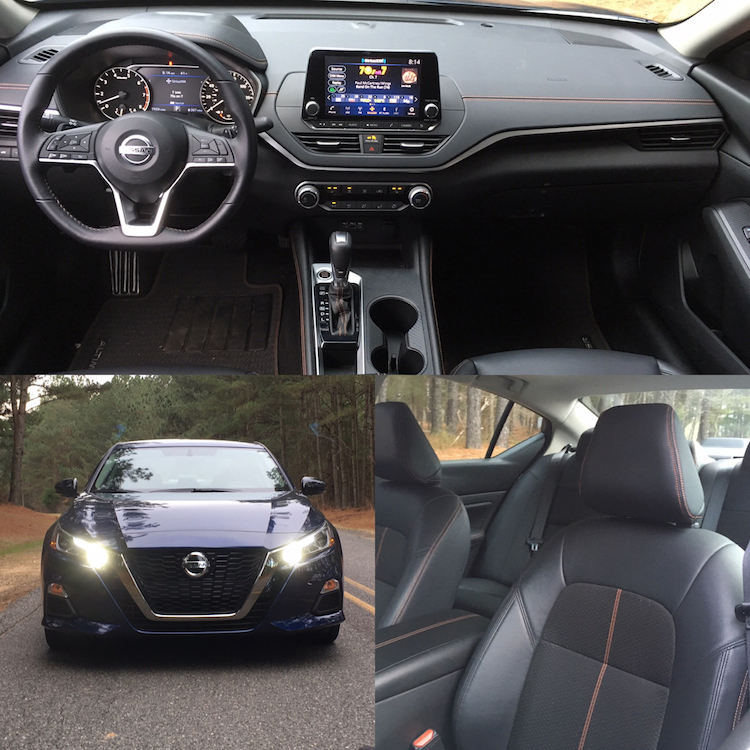 Nissan equips the 2019 Altima with full power accessories, a tilt-and-telescoping steering column, air conditioning, a power driver’s seat, heated front seats, map lights, and rear reading lights. The list of upgrades includes leather-trimmed seats, dual-zone climate control, and interior accent lighting. We’ve already looked at the technologies available, but one point is worth repeating: ProPILOT Assist is not available with the base models. It is standard beginning with the SV trim. As for the standard audio package, you’ll find a six-speaker audio system with HD Radio, satellite radio, four USB ports (two front and two rear), Siri Eyes Free, Google Assistant, Bluetooth, and an 8-inch color display. Move away from the base models and you’ll find a 9-speaker Bose audio system. Concerning navigation, you can obtain it through your smartphone thanks to Android Auto and Apple CarPlay compatibility. Otherwise, a navigation package is standard beginning with the SL trim. Today’s family sedans are powered by four-cylinder engines — almost exclusively too. A V6 isn’t necessary to move these models, although they are missed by some. Fortunately, the base engine in the Altima is quite adept as it delivers an ideal combination of kick and efficiency. 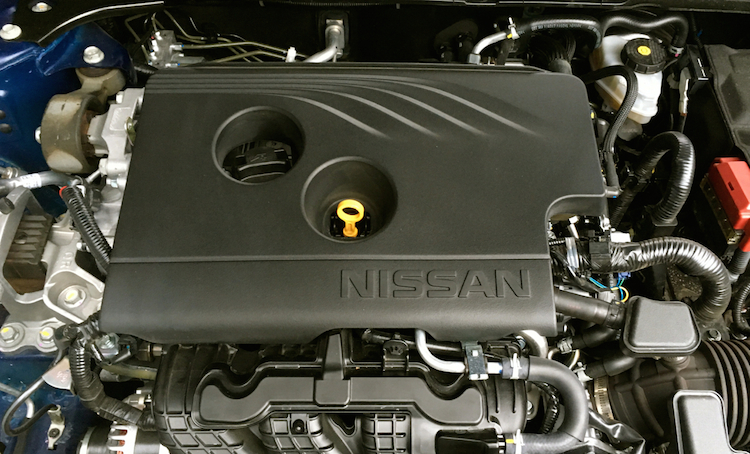 Nissan pairs this engine with a continuously variable transmission. Its a package loved by some and detested by others, although the efficiencies gained cannot be argued with. Further, Nissan’s powertrain mapping ensures that the CVT never taxes the engine to the point where it sounds like something will snap. Instead, as the RPMs reach peak levels, they kick back a bit before climbing again. Most people will find the Altima delivers ample step-off acceleration and passing power. Steering is light, not especially engaging, while handling is spot on and is particularly sharp in the SR edition. What really got our attention was this sedan’s efficiency. While we didn’t track fuel economy specifically, we did notice how slowly the fuel needle made its move. In fact, after exactly 250 miles of driving, the gas gauge still hadn’t touched the halfway point. We’ve seen many smaller cars come up short in the mileage department, but the Altima didn’t. Not only that, it excels. Fuel prices may be low (as of this writing), but cost savings at the pump are still noteworthy. Build a 2019 Altima and you’ll be presented with 13 options. That’s a lot for a midsize sedan. However, some of those choices are overlapped by the all-wheel-drive and turbo engine options. The base S model starts at $23,900 and is followed by the SR ($25,250), SV ($28,080), SL ($29,990), and Platinum ($33,750) editions. Add $895 for the destination charge. Upgrading to all-wheel drive adds another $1,350. As for the turbo option, you’ll find it on three trims: SR ($29,300), Platinum ($34,930), and Edition ONE ($35,750). You’ll also find package options on some trims, but not on all. For example, a Premium Package ($1,050, power sliding glass moonroof, heated outside mirrors with turn signal indicators, and heated front seats) is available with the SR model. Our choice is the SR edition with front-wheel drive. It is a great place to start and end your search, but we realize that some people will want additional amenities found further up the trim range. We like the all-wheel-drive option and think it’ll be the choice of a significant number of shoppers in snow-bound states. To date, you may have done well with front-wheel drive, especially if you place winter tires on the front wheels. That said, the AWD option is worth your consideration. Just remember that it comes only with the standard engine. All in all, the 2019 Altima presents a strong option in a still very competitive segment. Nissan could have chosen to heavily refresh its midsize sedan and called it a day. Instead, the automaker invested a tidy sum of cash to not only keep the Altima relevant, but make it a formidable model amongst its peers. Vehicle assembly: Smyrna, Tenn. or Canton, Miss.